Our roofers in AZ will provide you with roof repairs or new roofing. Plus, we also offer free inspections in case your roof may have been damaged in a recent storm or is just near the end of the warranty and may need replacing. Would you value getting a brand new roof if it were free to you? One of the things that can be most surprising to our roofing clients in Arizona is the possibility that their roof may need major work that will be totally covered under existing warranties or home insurance policies. In some cases, even when the external damage may seem minor to you, we have helped home owners in Arizona to get their entire roof replaced with no cost to them at all (including when they had already covered that year’s deductible on their home insurance).Basically, roofs come with warranties. Many roofing companies have issued warranties for long periods such as 20 years that are “very generous” to home owners in Arizona. Why do I call those long roof warranties “very generous” to people in Phoenix? Many kinds of roofs do not last as long here in central Arizona compared to other states (so the roofs need major repairs or replacement sooner than they usually do outside of Arizona). However, the full warranty protections still can be active past the normal lifetime of your roof. Why do certain kinds of roof not last as long here in Phoenix? The unusual stress of intense summer heat plus annual monsoon storms (with damage from hail plus gusting winds) can can result in the need to repair or replace your roof much more often in Arizona than if that same roof was in another state. 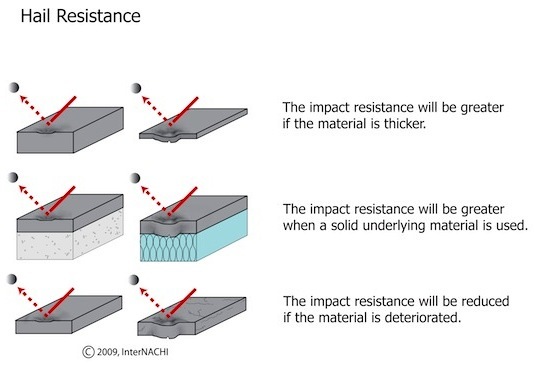 <A href=”https://www.nachi.org/asphalt-comp-shingles-part48-102.htm”>National Association of Certified Home Inspectors</a>), note the bottom of the three sections. When the roofing material is already deteriorated (like by a decade of Phoenix heat far over 100 degrees), then a single hail stone can cause significant damage leading to the potential for a leak (and massive insurance claims for water damage). In some cases, there is damage to the roof in so many places that our roof inspection specialists can take photos and make measurements that get the attention of the warranty provider or insurance company. Insurance companies in particular do not want a slowly leaking roof to lead to much more extensive water damage or mold. 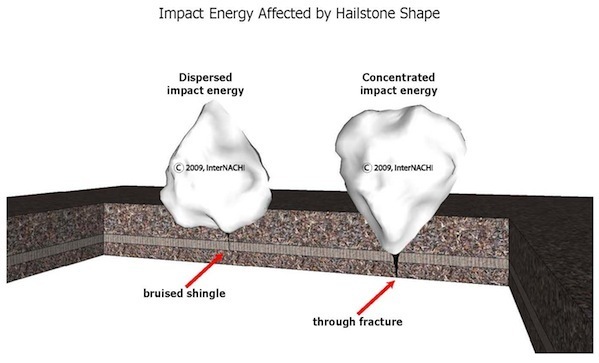 This is especially true of asphalt shingle roofing in Phoenix, which can fracture (crack open) when damaged by a hail storm. So, when the effectiveness of the roofing has been sufficiently compromised (what the insurance companies call “disturbed” roofing), then they will often approve paying for a full roof replacement. They know that the cost of all of the individual repairs can actually be larger than replacing the roof. Further, the insurance companies know that roof warranties in Arizona are often “generous.” That means that if your roof warranty is near expiration, your insurance company may favor paying for a new roof (which starts over a new period of warranty coverage). The insurance company wants new warranty coverage because that new warranty reduces the future financial risks of the insurance company.